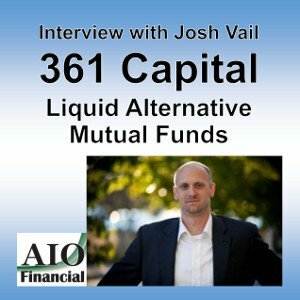 This podcast is an interview with Josh Vail from 361 Capital. 361 Capital is an investment management firm that is solely focused on liquid alternative investment (alternative mutual funds). They were founded as Hedge Fund of Fund in 2001 and managed money for ultra-high net worth individuals, foundations and institutions. They started to move to products with greater liquidity due client demand in 2006 and in 2009 starting packaging our “intellectual capabilities” into investments products that we available to all investors not just the very elite. Today they have four mutual funds some of which our managed in house and a long short fund that is managed by a Sub-Advisor that we’d know since our Hedge Funds days – Analytic Investors. In general, long/short equity is an investing strategy that takes long positions in stocks that are expected to “outperform” and short positions in stocks that are expected to “underperform.” A long/short equity strategy seeks to minimize market exposure, while profiting from stock gains in the long positions and price declines in the short positions. There are studies that show that if you look at companies in a particular industry, the companies with less volatility outperform companies with high volatility. 361 Capital buys stocks, (about 70% of their portfolio) which are long positions, that have low volatility and they short, our bet against, companies with high volatilies. They measure volatility using a descriptor called beta.